I have more than just a homemade red currant jelly recipe, check out more homemade recipes at the end of the page. If you have currants, then you will appreciate this easy recipe for red currant jelly. I also give easy instructions on canning jelly, jam, preserves and conserves (that's just for starters). To harvest this bountiful fruit, simply pick the entire cluster and either freeze them to make jelly at a later date, or make jelly immediately. Using a heavy-bottomed deep saucepan, crush the currants, one layer at a time. Add between 1/2 to 1 cup of water; enough to bring the contents to a full rolling boil. Reduce the heat and allow the currants to simmer for 10 to 15 minutes. Immediately pour the hot berries and juice into a colander lined with cheesecloth and strain. It may take all day to strain fully. Do not force the juice through the cheesecloth because pulp will escape and your jelly will be cloudy. After you have strained between 4-1/2 to 6 cups of juice, discard the seeds and pulp. Measure five cups of juice and bring to a boil. Add the liquid pectin and the sugar and bring to a full rolling boil that cannot be stirred down. Remove from the heat and skim the foam. 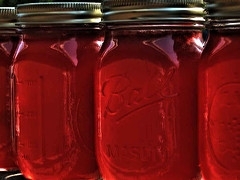 Ladle the bright red jelly into clean, sterilized pint and half-pint jars, leaving 1/4 inch head space. Adjust the sterilized lids and rings and place the jelly jars into a canner filled with hot water. The water should be at least one to two inches over the top of the jars. Bring the water to a full rolling boil for ten minutes. Remove the jelly from the hot water bath, secure the rings and set the jars on a folded towel to cool, away from drafts. Make sure the jars are spaced at least one to two inches apart. Follow the directions on the powdered pectin package completely. Do not deviate from the measurements, as that may result in jelly that will not set. Though gooseberries contain a lot of pectin, you don't want to take chances with your jelly not setting. To make sure your jelly sets, use some form of pectin. If you don't have any commercial pectin available, try using some of the unripe and ripe currants. Currants that are at the just-under-ripe stage are highest in pectin, but their flavor will not yet have reached its peak.